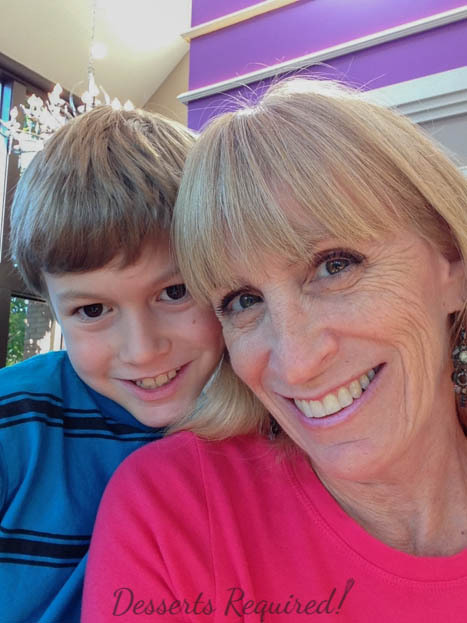 This is a very special post for me because Samuel, my 8 year old, and I wrote it together. 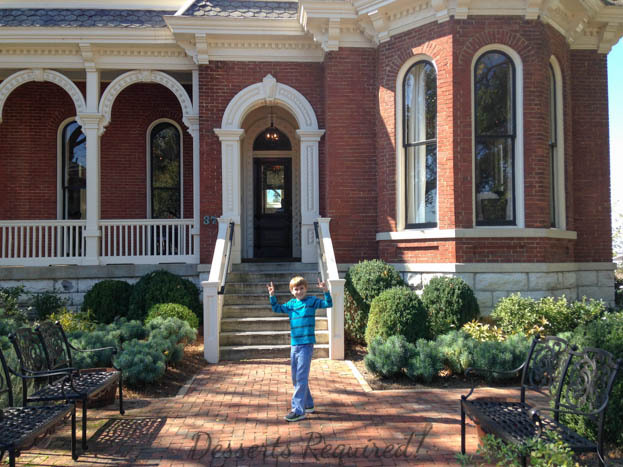 Samuel and I went to Nashville two weeks ago for our cousin Sylvie’s Bat Mitzvah. We arrived before everyone else, which meant we had time for one meal on our own. It took about 3 seconds for me to decide to make a reservation at Husk where James Beard Award-winning Chef Sean Brock is at the helm. Besides being two people I love dearly, Sylvie’s parents are, also, two of the biggest foodies I know. 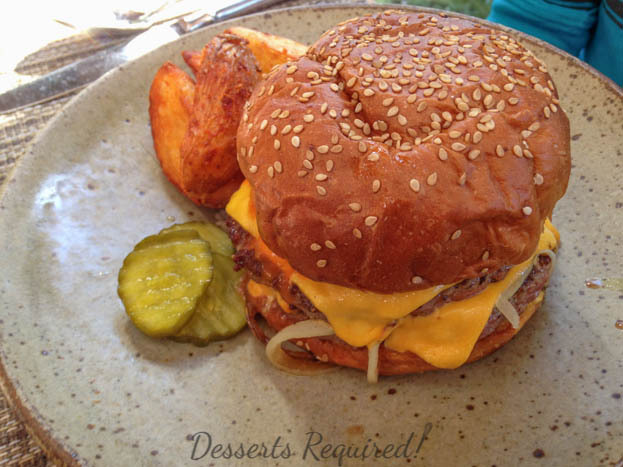 I have heard them talk about the cheeseburger at Husk since it opened. Pastry Chef Lisa Donovan is a friend of theirs so I was, truly, excited to meet her and with good reason…Lisa is lovely, gracious and incredibly talented. Samuel and I were both ravenous and asked for bread while we waited for our entrees. As Samuel said, “This is fabulous.” It was with sesame seeds and salt on the crusty outside with a soft, pillowy texture inside. On the way to Husk Samuel voiced concern about splitting the cheeseburger with me, stating that I like ingredients that he does not. I told Samuel that often times, he ends up eating what I order because he loves the combination and I asked him to trust me on this one. My intention was to split the cheeseburger and veggie plate. When the cheeseburger came to the table, I cut it in half and then cut my portion in half. We both took a bite and the world stopped. Samuel declared that it was the BEST BURGER EVER and told both General Manager Kenny Lyons and me that the chef HAS to get a television show and teach everyone how to make their amazing burger. I can’t say that I disagree with Samuel. A Plate of Southern Vegetables…done right! The plate of southern veggies did not disappoint, either. This turned out to be a good thing because that ¼ of the burger that I ate was the ONLY burger I ate. Samuel ate ¾ of the cheeseburger without even offering me another bite. There were three options on the dessert menu so, naturally, I ordered one of each. I wish that I could, honestly, write that Samuel is all about desserts but after eating both of our portions of the burger, he was pretty stuffed. Not a problem for me. 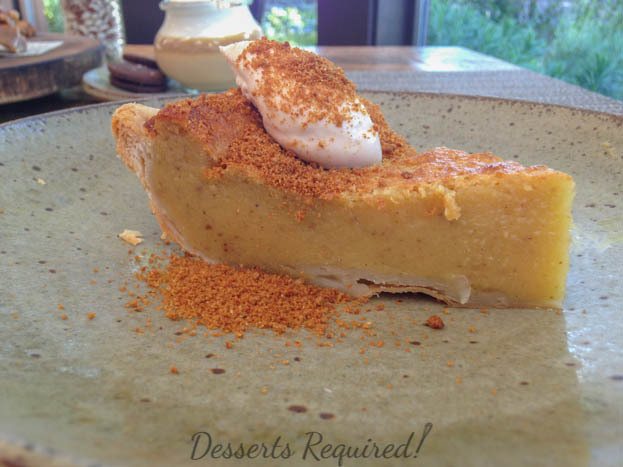 I loved the Sweet Potato Buttermilk Pie with cinnamon crème fraiche and sorghum gingersnap crumble as well as the Cookie Plate with vanilla wafers, bourbon pralines, buttermilk lemon bars and gingersnaps; but, try as I did, I could not finish them. Not to worry about the leftovers because our cousins inhaled them later that day. 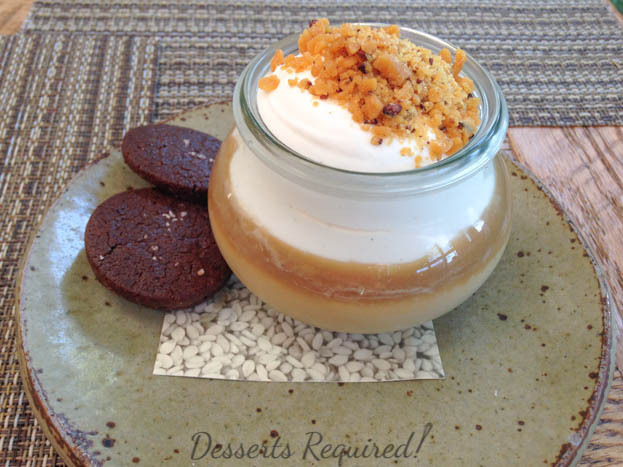 Lisa’s Butterscotch Pudding with sweet cream and cocoa nib brittle was nearly licked clean. 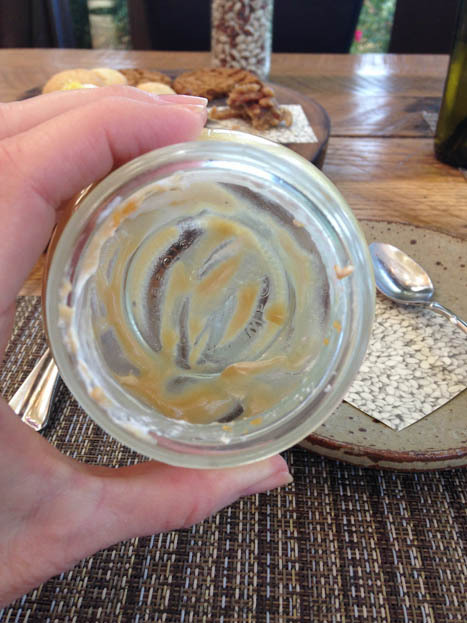 The only reason it was not, totally, cleaned was that my mouth did not fit into the jar! I was very sad when I realized it was, really, all gone! Samuel and I left Husk realizing that there was one thing that, most definitely, has to change. 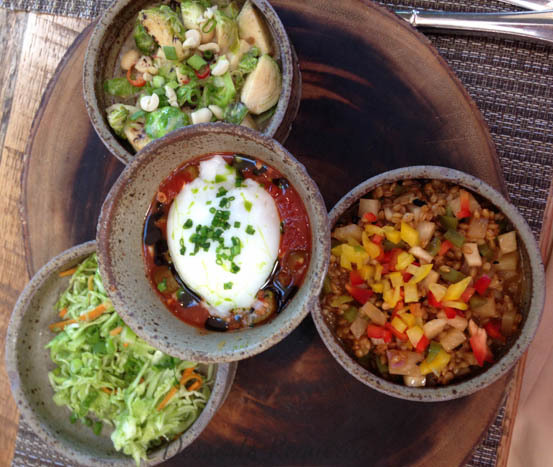 Husk needs to open in South Florida! I don’t really think this is an odd request. 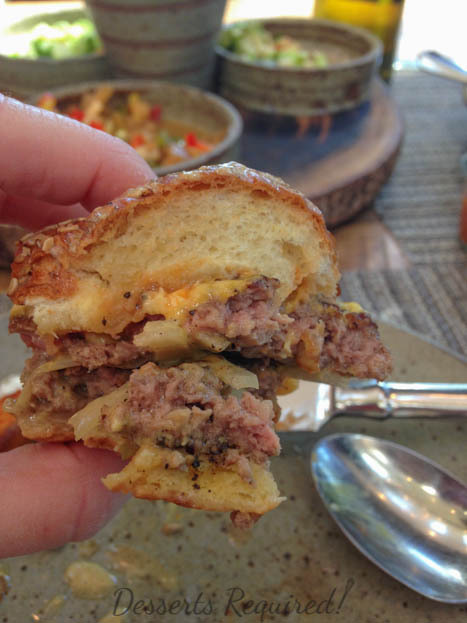 Chef Sean Brock’s rule is, “If it doesn’t come from the South, it’s not coming through the door.” Great! Florida is in the South and we need Husk here. Until that time, Samuel and I are, already, talking about our next trip to Nashville. Thank you – and….I would order you one just for you!! I’m not THAT good of a sharer! 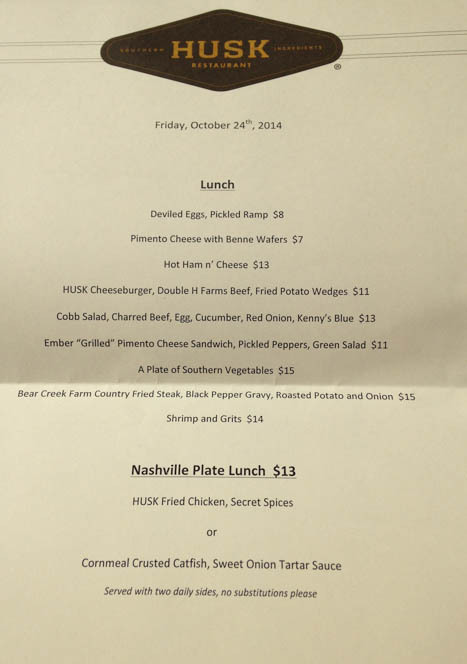 Husk definitely looks like a must-do if in Nashville. 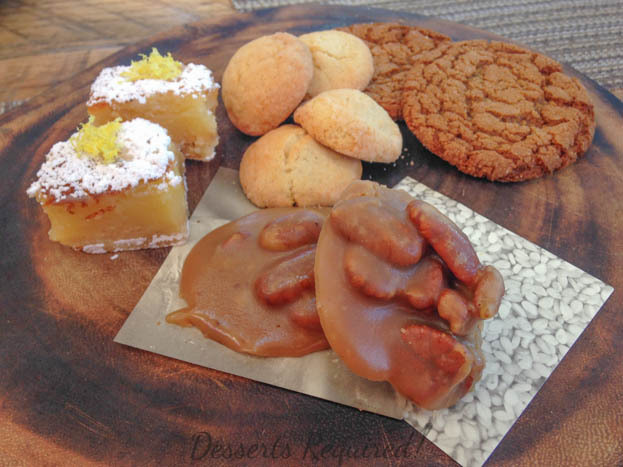 Such a sweet photo of you and Samuel…And if he says it’s the best burger ever, well, it must be =) Love to taste that authentic sweet potato pie and the lemon bars and everything else on the cookie plate! And who knows I might even taste the catfish on the menu =) Trust you had a fantabulous time, too at your cousin’s Bat Mizvah. Thank you. You are SO sweet. Everything about the weekend in Nashville was fantastic We loved the time with our family and, of course, the delicious food at Husk!